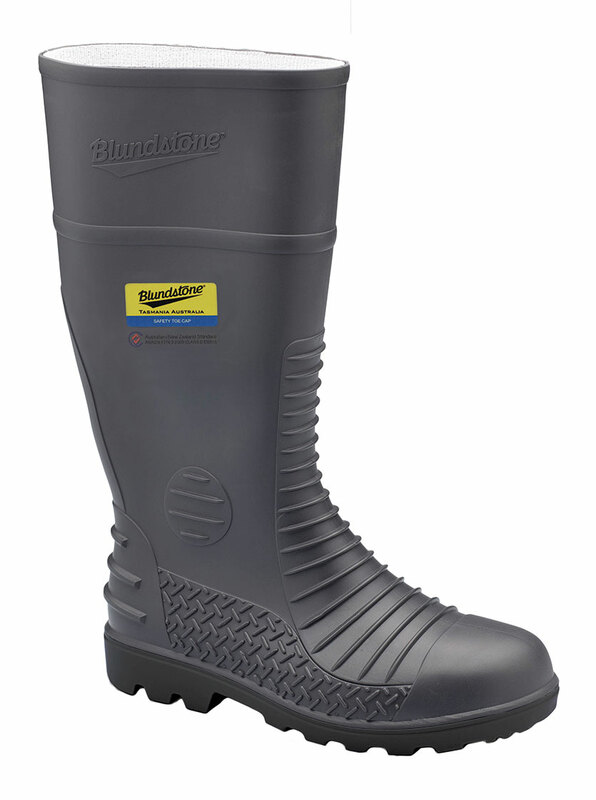 Grey waterproof safety gumboot with penetration resistant midsole. PVC/Nitrile compound that is chemical and acid resistant. Wide fit to accommodate broad feet with wide heavy duty tread base for extra stability and a sole pattern that resists clogging providing superior grip in most conditions. Soft metatarsal pad to cushion the delicate metatarsal area, reduce stress on pressure points and increase overall foot comfort. Removable luxury PU footbed with arch support and PORON®XRD, Distinctive upper with additional protective patterning providing greater resilience to cuts and abrasion in vulnerable areas. reinforced ankle, heel and instep, rear kick off lip, plush knit lining. wide fitting steel toe cap. Electrical shock hazard resistant. Grey waterproof safety gumboot. PVC/Nitrile compound that is chemical and acid resistant. Wide fit to accommodate broad feet with wide heavy duty tread base for extra stability and a sole pattern that resists clogging providing superior grip in most conditions. Soft metatarsal pad to cushion the delicate metatarsal area, reduce stress on pressure points and increase overall foot comfort. Removable luxury PU footbed with arch support and PORON®XRD, Distinctive upper with additional protective patterning providing greater resilience to cuts and abrasion in vulnerable areas. reinforced ankle, heel and instep, rear kick off lip, plush knit lining. wide fitting steel toe cap. Electrical shock hazard resistant.